Travelling to San Andrés is not one of the easiest trips in the world. The island is located in a pretty remote location of the Caribbean Sea. The nearest mainland is Nicaragua in Central America at a distance of around 145 miles. San Andrés is part of Colombia but mainland Colombia is far away at almost 500 miles! The most common ways for traveling to San Andrés is by cruise ship, sailboat or plane. Caribbean cruises often stop at San Andrés to let the people relax and dive in the waters around the island. Flying is the fastest way but can only be done from the mainland Colombia, Panama or Costa Rica. When you are going on a trip or excursion around the island to one of its many cayes you will travel in a water taxi or speedboat. How do you want to travel to San Andrés? Flying to San Andrés from Medellin, Cartagena, Bogota or Cali in Colombia or from Panama City or San Jose in Costa Rica. The other option is taking the sailboat to San Andrés. But this is currently to dangerous because of pirates controlling the sea’s around Nicaragua. Maybe in the future the sailcharters will sail again to San Andrés! Are you in the possession of a sailboat and are you sailing the Caribbean? 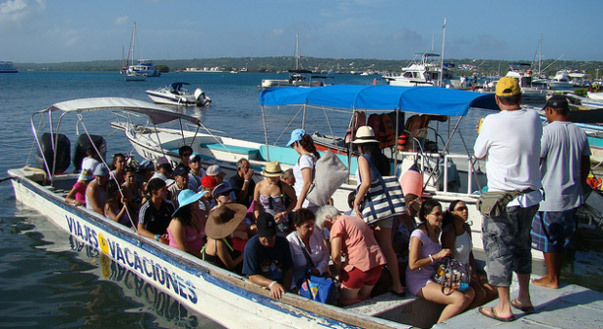 Then chartering people from the mainland to San Andrés might be an adventure for you and the passengers. If you offer such kind of service we would like to list your ship services for free on our website. Contact us now for the listing of your sailboat service.